Role of care givers especially women/mothers is critical in promoting family care practices. The Seven Things This Year Initiative aimed to engage women and mothers to enhance their role and contribution to child health and development. This community empowerment programme will also enable them play a greater and supportive role in better health of their children, families and communities. In collaboration with DOH (WCHD) and UNICEF, ‘Seven Things This Year Initiative’ is being implemented since 2012. The overall objective of this initiative is to empower caregivers especially women/mothers in the promotion of family health. This programme is being implemented in phased manner. 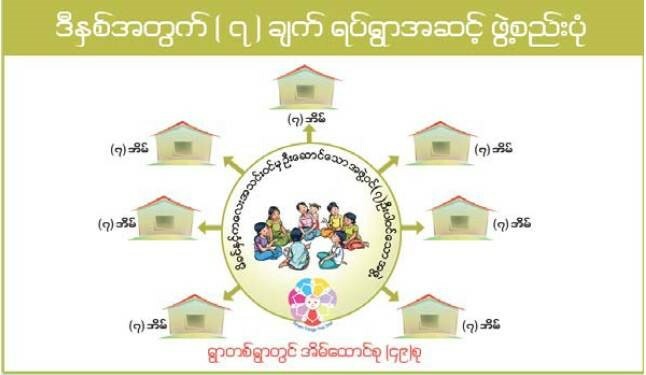 Phase 1; In 2012, it is piloted in 2 wards & 100 villages in Myingyan and Kyaukpadaung townships. Phase 2; In 2013, it is expanded to 3 wards, 150 villages in Thahton, Hpa-an, Dawei townships and additional 12 more villages each in Myingyan and Kyaukpadaung townships. Phase 3; In 2014, it is also scaled up to 6 wards, 300 villages in Hlaingbwe, Paung, Oktwin, Lashio, Tharbaung and Mindon townships. Through the MMCWA volunteers the women/mother groups will be formed in each village/ward of the selected townships to take lead in promoting six family care practices as well as a local child health issue. Each member of the group will be tasked to reach out seven families to persuade the family members on the family care practices. The MMCWA Volunteer will be the focal and converging point of the village holding regular meetings of the group. Her main role will entail the mobilisation of women members towards common challenges and tailoring local solutions around family care practices. Formation of a 7 member mothers/women group in a village/ward. Each group member must take care of 7HHs where there is under 5 children including her own household. Community mobilization by means of monthly meetings, folk performances & community day events. Each group to meet every month to review the progress of each member and agree on the next steps. Preparing special meals, put water & soap outside latrines to wash hands, making their households more relevant to recommended behaviours. All mothers/women reached by the group to review and celebrate the progress on family care practices and discuss plans for the remaining period. Linked with local festival - Group to arrange distribution and display of material at the public places, during festivals and special campaigns. At the end of the year, a completion certificate/recognition plate will be presented to each household who are practicing recommended behaviours. It was reported that 28,665 households with more than 290,000 community members in 11 selected townships received knowledge about seven key family practices. 3,927 core members including 561 group leaders were formed reaching a total of 180,000 direct beneficiaries. Core members are persuading their families and peers to practice key family and community care practices through sustained dialogue under this initiative.